Now the undeniable creative leader of the Korean film movement of the last decade is by far and away Park Chan-wook. Starting with 2000’s JSA: Joint Security Area director Chan-wook has delivered diverse and ground-breaking films like the three films that make up the Vengeance Trilogy (Sympathy for Mr. Vengeance, Oldboy and Sympathy for Lady Vengeance), I’m a Cyborg, but that’s OK, and Thirst. 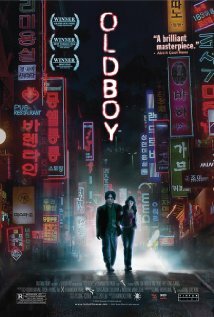 Even though the Toronto Korean Film Festival wrapped over a week ago, I would like to use the background of the TKFF to talk about one of my favorite Korean films of all time, Old Boy. Oh Dae-su (Min-sik) has always been a troublemaker. We open in a police station where Dae-su has been brought in on a drunken disorderly charge. After a series of funny outbursts Dae-su is sprung by his high school friend No Joo-hwan (Dae-han). It’s also Dae-Su’s daughter’s birthday and as Joo-Hwan talks to Dae-su’s wife explaining that he will get Dae-su home he suddenly disappears from a crowded street. Dae-su wakes in a locked room without any explanation. This cell will be his home for the next 15 years. We watch as Dae-su goes through his routine inside the cell, occasionally getting dosed with knockout gas so that his sheets can be changed and his hair cut, as he fights depression and starts training and preparing for whenever he may get released by punching a solid brick wall. One day 15 years later Dae-su wakes up on a roof of a building in the exact same spot where he was taken 15 years earlier. A suicidal man stands on the ledge of the building ready to jump until Dae-su forcefully makes him listen to his tale. After his confession the man states he wants to tell his tale which prompts Dae-su to stand up and promptly leave without another word. Dae-su wanders the streets until he ends up in front of a restaurant when a homeless man gives him a phone and wallet full of cash with the simple statement “Don’t bother asking me anything, I know nothing”. Once entering the restaurant Dae-su meets Mi-do (Hye-jeong), a young server/cook who looks to help him, and after receiving a phone call from his captor promptly passes out. Dae-su ends up at Mi-do’s home and she becomes his accomplice in piecing together the missing 15 years. Eventually Dae-su meets with Lee Woo-jin (Ji-Tae) and his accomplice Mr Han (Byeong-ok). Woo-jin gives him 5 days to discover who he is and why he imprisoned him for 15 years. The story continues as Dae-su unravels the mystery and moves along to one of the most shocking twists in film history. Choi Min-sik has never been better than he is as Oh Dae-su. If he truly is Korea’s Robert DeNiro (he is) then Oh Dae-su is his Jake Lamotta or Travis Bickle, or maybe more appropriately the two of them combined. Min-sik is simply brilliant in one of the greatest performances I have seen on-screen. Kang Hye-jeong’s Mi-do is the reason Dae-su comes back to reality and does not simply fly off the handle in an infinite fit of rage. The rest of the performances are just as solid throughout. Wook-park once again proves his mastery in casting and storytelling. Oldboy has become iconic for its hallway fight sequence, where Oh Dae-su decimates a small army with only a hammer in hand, and its stunning final sequence. But it’s the smaller sequences like those in the jail cell and the ever cryptic ending that flesh out the story and really drive the impact home. Oldboy is one of what I like to call an “all-time top tenner” as I love it so much it will seemingly always have a spot on my all-time top ten films list and in many other top ten lists as well. I cannot recommend Oldboy strongly enough, it is an absolute must see. The first ever Toronto Korean Film Festival wrapped on July 1st after a nine-day run in its first year. The highlights of the festival were the films of course, closing with the latter two entries of the famed Vengeance Trilogy from Park Chan-wook, Oldboy and Symapthy for Lady Vengeance on 35mm film prints, highlighting some of the best that Korean Cinema has to offer. Of course there were ups and downs, as with any fest going through its first iterations, growing pains if you will, and the TKFF is no exception. First off, while I was not present for the opening gala which I did hear run late, there seemed to be some disorganization with lineups and showtimes as for the first weekend not one film started at its designated start time. Now while this is not a rarity in film festival land, the fact that we were not even seated for most of these performances until after the scheduled start time is. To the festival’s credit by the 2nd weekend this seemed to be an issue of the past, at least I hope it is. Also, the exact same spooling of header/commercials greeted us before every showing, which is not entirely bad, but with the attendance being mainly a smaller but dedicated crowd attending more than one show, mixing up the clips and maybe getting more director endorsements might be the way to go next year. And personally I was hoping for more of a “taste” of Korean culture in general surrounding the festival throught its duration (I understand was more prevalent on opening night). That said I cannot deem the first offering of TKFF as anything less than a minor success. I know they were hoping for better attendance, and that will come with time, but the basis for any successful venture like this lies in its people and in that category TKFF flourishes. The cast behind the scenes is a group of friendly, enthusiastic and talented people that I personally wish every success with this fest for years to come. The films may have been the main attraction but they were a close second. How TKFF returns next year remains to be seen, I feel they may be better served with 5 nights instead of 9 with 3 or 4 shows on the weekends but that’s just me, whether they change venues or go completely new release without the ‘best of’ format one things is for sure, if it’s the same people behind it you will see me in line with my ticket in hand. 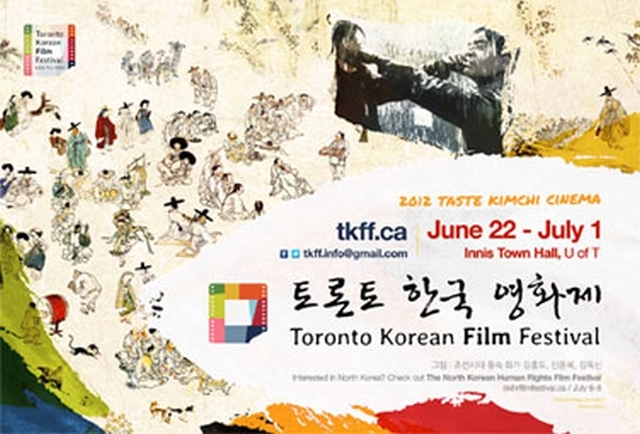 You know ultimately, I have to rate the first edition of TKFF (Toronto Korean Film Festival) a minor disappointment. Growing pains and organizational hiccups are understandable given that it was a first year event, but there was just too much wrong with the entire event. It was far too long for a first time festival; 9 days was more than a little ambitious and given the pedigree of some of the programmers, organizers and advisors it was a little too much. For a first time festival going entirely retro is good enough and it had more than its fair share of highlights. The opening night film of “Secret Sunshine” was a stunning and heart wrenching drama, and while some of the screenings like “Tale of Two Sisters”, “Save The Green Planet” and the aforementioned Park Chan-wook films that closed out the festival had the added bonus of being displayed on 35mm film prints, there were some films that just didn’t work. Films like “Epitaph” and “Failan” that had their Toronto premieres were not very strong and while I’ll admit that there may have been a cultural divide in regards to the animated film “Leafie”, it was one of the more awkward and potential inappropriate animated films I have seen in some time. Going forward I would recommend trying to accentuate more of the cultural aspects that could have been there, even if it’s just a Kimchi station on opening night and while retro programming does have its place in most film festivals, they desperately need to add newer films that a great portion of the general public are oblivious to, in order to expand their audience. It was an OK start for TKFF and I certainly hope they get the opportunity to do this again next year, but they do need to make some big changes and learn what aspects that they need to focus on more if they want to have better success in the coming years. Now the undeniable creative leader of the Korean film movement of the last decade is by far and away Park Chan-wook. Starting with 2000’s JSA: Joint Security Area, director Chan-wook has delivered diverse and ground-breaking films like the three films that make up the Vengeance Trilogy (Sympathy for Mr Vengeance, Oldboy and Sympathy for Lady Vengeance), I’m a Cyborg but that’s OK, and Thirst. Even though the Toronto Korean Film Festival wrapped over a week ago, I would like to use the background of the TKFF to talk about my two favorite Korean films of all time, Old Boy and Sympathy for Lady Vengeance. Lady Vengeance starts with the release of Lee Geum-ja, after 13 1/2 years in prison for the kidnapping and murder of a young boy. Upon her release a preacher (Kim Byeong-ok), who she has been working with during her incarceration, meets her in front of the prison with the traditional present of a block of tofu. The tofu symbolizes a “white life” or not breaking the law again after her release. Geum-ja promptly dumps the tofu on the ground and walks away. You see, Geum-ja has been the perfect inmate for a reason, because it has served her plans for revenge to have everybody she helped inside help her execute her plan. Forced to take the blame of the kidnapping/murder by the devious Mr. Beak (Min-sik), Geum-ja was also forced to leave her newborn daughter behind as well. We see a series of flashbacks to prison sequences where we see how Geum-ja earned the nickname “The Witch” in prison; she dispatches one abusive inmate over a series of years in a very deliberate and methodical manner. Each of the inmates she helped in prison will now play a part in her grand master plan to exact her revenge. After tracking her daughter down to Australia where she was taken after adoption, we are introduced to the precocious Jenny (Yea-yeong) who ends up demanding to go back to Korea with her mom, complicating things further. 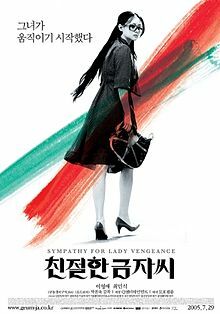 While filled with cameos from actors that have been in both of the two prior Vengeance movies (Sympathy for Mr Vengeance and Oldboy), Lady Vengeance keeps ratcheting up the suspense until the surprising and extremely effective ending. This truly is a fantastic film. Lee Yeong-ae is mesmerizing on-screen, her performance is flawless as the wronged Geum-ja. She dominates the screen whenever she is on it and in one second can be flat-out mean then angelic a mere second later. Wook-park’s strongest female protagonist, which is saying something as he forms female characters very well, Geum-ja is a brilliant character whose story is truly compelling. Of course Geum-ja needs a strong protagonist to make this story work, so Wook-park goes to the big gun and brings in the incomparable Choi Min-sik. I have said this many times to friends and others in conversation and will state it here and now in print, Min-sik is Korea’s version of Robert Deniro circa the Mean Streets through Goodfellas era. Yes he is THAT good and he immediately elevates everything he does, more to come on him in my Oldboy review. The rest of the cast also does admirable work in spinning a fascinating tale that never ceases to surprise. Wook-park’s direction is masterful and his story building expertise is on full display. After the Masterpiece that is Oldboy, Lady Vengeance could have been a letdown as so many follow-ups are. Instead we are treated to a completely different tale that manages to more than hold in Oldboy’s shadow. Sympathy for Lady Vengeance is an absolute must see. After bursting on to the scene back in the late nineties with The Quiet Family (1998) and the Foul King (2000), director Kim Jee-Woon’s first international success came with A Tale of Two Sisters in 2003. This film has personally been avoiding me for a while, despite the fact that I actually OWN a copy of the DVD and for some reason it’s never jumped to the top consideration for movies in the pile of other contenders. But thanks to TKFF I was able to see it not only on the theater screen at Innis but also on a beautiful 35mm print. And I have to tell you I’m so glad I waited. A Tale of Two Sisters starts with the return of Soo-mi (Su-yeong) and Soo-yeon (Guen-young) to their home in the country after stay in a mental health institution. The Sisters were placed under psychiatric care after the death of her mother, the details of which we are not privy to right away but will see unfurl over the course of the film, which had a dramatic effect on the two of them. Their step-mother Eun-joo (Jung-ah) is awaiting their return; she came on the scene during their mother’s illness and never left. Eun-joo is a domineering and abusive woman and takes out her frustrations on Soo-yeon as she physically assaults her and throws her into a wardrobe and locks the door on her. Soo-mi is defiant and pushes back against Eun-joo at every turn while desperately try to fill the void of missing mother for the more gentle Soo-yeon. But things are never as they seem in this household and Soo-mi’s secret could cause everything to come crashing down. A Tale of Two Sisters is the story of a troubled young girl and requires a strong performance to pull it off. Fortunately the performances are strong all around. Brilliantly paced and thought out, Jee-woon has crafted a sublime little thriller here. The sisters played by Lim Su-jeong and Moon Guen-young are completely believable as siblings. Both turn in fantastic performances despite having little experience at the time. Yum Jung-Ah as the step-mother is ingeniously vicious and menacing throughout. Jee-woon’s expertise is used to the fullest here creating a creepy and uneasy atmosphere and never taking the easy way out with the story. You can easily tell where the staging here has paid off in later films of his, like 2010’s I Saw the Devil. Gripping and involving, A Tale of Two Sisters succeeds in both tone and story. I can say that Tale of Two Sister is a pretty strong recommend. The Toronto Korean Film Festival continues until July 1st with screenings of the amazing Mother, Failan and a near perfect cinematic closing night of Sympathy for Lady Vengeance and one of my favorite films of ALL TIME in Oldboy. Tickets still available. TIFF Midnight Madness veteran Save the Green Planet closes out Sci-Fi night at the inaugural TKFF. Jang Joon-hwan’s bizarre and surreal abduction black comedy has been garnering accolades for years on the festival circuit and seems to be the perfect companion for the opening film on Sci-Fi night, Invasion of Alien Bikini. Green planet also brings mental illness and possible delusion into the mix to further muddle the issue. Lee Byeong-gu (Ha-kyun) is a troubled man who is convinced aliens live amongst us and that he is the only one who can protect us from the oncoming onslaught. After recruiting his spouse/girlfriend Su-ni (Jeong-min) into helping him, he drugs and kidnaps prominent businessman Kang Man-shik (Yun-shik), convinced he is really alien in disguise. Byeong-gu hypothesizes that Man-shik’s status must allow him access to the more protected of alien information and he must derive from him the information as to when the alien prince will land on earth and decide earth’s ultimate fate. Meanwhile, disgraced Inspector Choo (Jae-yong) starts to put the pieces together with other missing person’s cases and sees a pattern. Determined to get all the information out of Man-shik, Byeong-gu embarks on a torture campaign to extract the information, while downing anti-depressants like candy. Eventually Su-ni leaves as she no longer can trust blindly what Byeong-gu is doing. And as the police close in is Byeong-gu’s delusion manifesting as he has forced his beliefs on an innocent man. But wait, did Man-shik just confess he actually IS an alien? A bizarrely goofy film from beginning to end, Save the Green Planet! is a scattershot jumble of comedy and torture that plays out like you’d imagine it does in Byeong-gu’s head, but it works. Lots of laugh out loud moments surrounded by strong performances and a fascinatingly original premise help makes Save the Green Planet! a fun watch from beginning to end. From its re-imagining of human history and brilliant 2001 homage to the drug addled ramblings of its lead, Green Planet works on almost all levels. Shin Ha-kyun and Baek Yoon-shik’s performances are the driving force of the film and they both prove more than up to the task. Hwang Jeong-min’s Su-mi is adorable and the most sympathetic character of the piece and she grounds the film in places where it can go completely go over-the-top. The film goes in place you will never expect with homages to popular North American cinema peppered throughout. Save the Green Planet! is a solid recommend as it ranks as one the most original and funny comedies to ever come out of Korea. The Toronto Korean Film Festival continues until July 1st with screenings of the amazing Mother, Failan, and a near perfect cinematic closing night of Sympathy for Lady Vengeance and one of my favorite films of ALL-TIME in Oldboy. Tickets still available.